This bronze vase is an excellent casting with good patination and consists of a removable gilt bronze liner with egg and dart decoration to the edge with intertwined handles to either side. 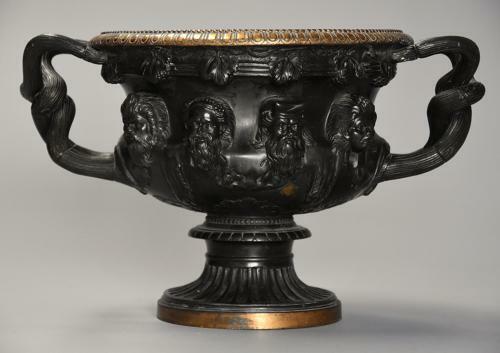 The main body of the vase depicting raised mask style heads of Classical Bacchic Gods (Gods of wine) with grape and vine leaf decoration with acanthus leaf below, all supported on a socle with gilt bronze base. The Warwick vase is an ancient Roman marble vase with Bacchic decoration that was discovered at Hadrian's Villa, Tivoli in Italy in around 1771 by Gavin Hamilton, a Scottish painter & antiquarian who also dealt in art in Rome, the original marble vase now on display in 'The Burrell Collection' in Scotland. This bronze vase is in very good condition, is of stable construction and can go straight into a home.